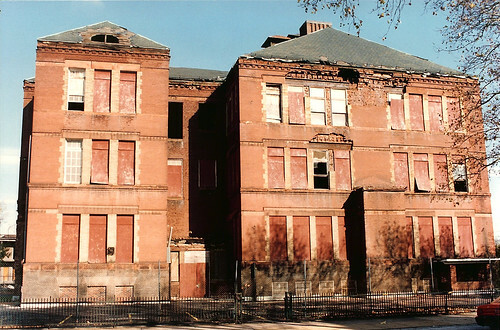 With the impending adoption of a new Facilities Management Plan the St. Louis Public School system I thought it would be appropriate to dig up another example of a senseless SLPS school building demolition from my archives. 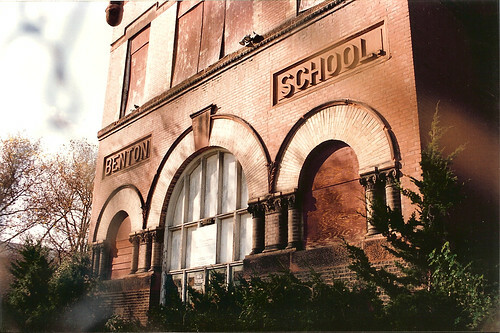 The Benton School was located at the southwest corner of Kingshighway and St. St. Louis Avenues. The site is now surface parking for All Saints Episcopal Church which is one block south. 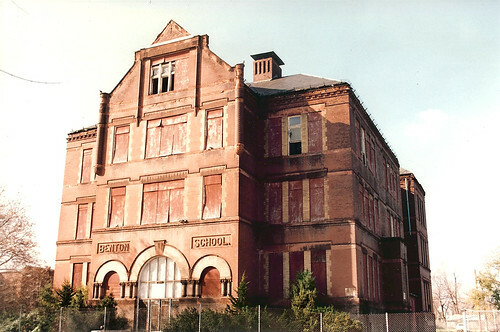 In July 1996 the school was condemned for demolition and a permit was issued in September. I am not sure who owned the school building at the time. As you can see from the photos, there was some roof damage and some isolated masonry damage on the south wall, but overall, the structure was in fairly decent shape. 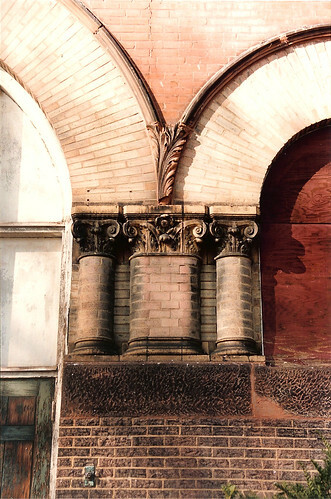 Its appearance was no worse than City Hospital on Lafayette prior to its restoration. Like the hospital, it was apparent that metal dormers and gutters had been stripped from the building by scrap thieves which likely accelerated deterioration. 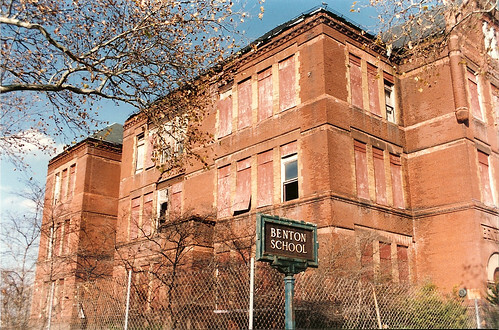 Benton School was very similar to the Harrison School which as Eco-Absence reported in December is slated for rehabilitation as affordable rental apartments. The buildings, both of which were designed by architect August H. Kirchner, share the same entrance features and well as almost identical massing and fenestration. 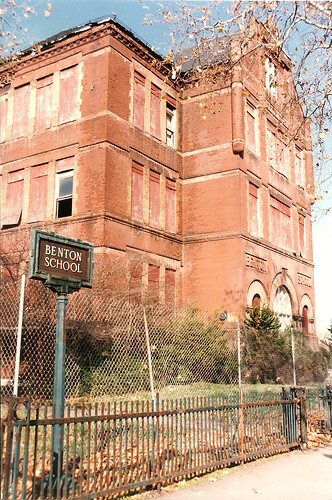 Ironically, Harrison School had been vacant since 1996, the same year as the demise of Benton School. 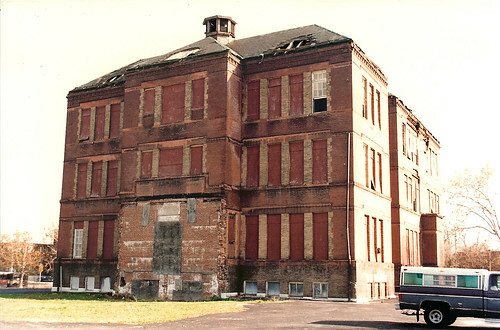 Another long abandoned school, the Grant School (1993-2005) was successfully rehabbed as affordable apartments by Cohen-Esrey. More information is available here on their site. The lesson here is that regardless of the circumstances, another beautiful rehab-able school building was senselessly demolished and replaced with surface parking. The new Facilities Management Plan needs to have stipulations that will prevent the future destruction of these irreplacable landmarks. St. Louis — The Special Administrative Board of the St. Louis Public Schools will hear recommendations by MGT of America, Inc. on the future use of district schools during the board meeting on Thursday, January 29, 6:00 p.m., at Vashon High School, 3035 Cass Ave.
All community members are invited to attend this open meeting to hear this much-anticipated report firsthand. However, due to the anticipated length of the MGT presentation, there will be no public comments taken at this meeting. The District will hold two special community forums for public comments - Wednesday, February 4, from 6:00p.m. - 8:00p.m. at Roosevelt High School, 3230 Hartford St., and Saturday February 7, from 10:00 a.m. – 12:00 p.m. at Vashon High School, 3035 Cass Ave.
Public comments may also be submitted via the Internet starting Friday, January 30, by visiting www.slps.org. The District will accept comments on the MGT presentation via the Internet through February 8. For more information, please call 314-345-2367. 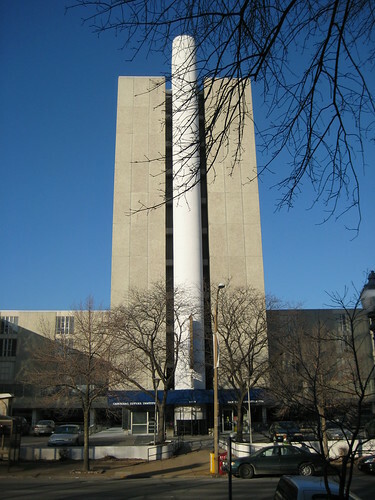 Recent posts on Urban St. Louis report that the Interim Archbishop has authorized demolition of the San Luis Apartments (former DeVille Motor Hotel) and that HUD is drawing up documents releasing the archdiocese from any requirement for affordable housing on the site, essentially giving the archdiocese the go ahead to do with the building as they wish. A group of people supporting preservation of the building will be meeting at Coffee Cartel this Thursday, January 22 at 7pm at Coffee Cartel (located at Maryland & Euclid) to discuss this situation and plan a course of action. All are welcome to join the discussion and help with the cause. The loss of the San Luis and replacement with a surface parking lot would leave a huge hole in the urban fabric of the Central West End and would be a slap in the face to the vibrant neighborhood. Below is a series quick before and after images done with Google Earth depicting the loss of the San Luis for a parking lot. 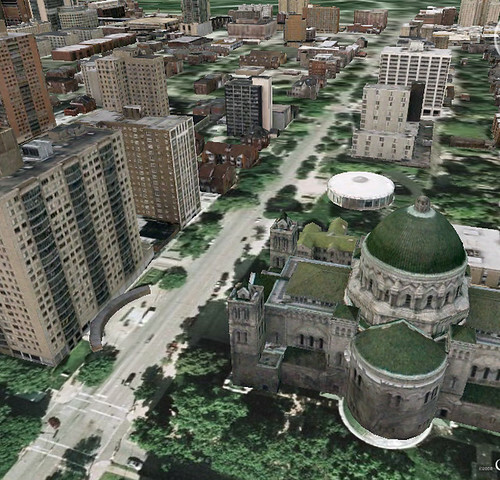 Don't be fooled by the archdiocese claims that their new parking lot would be "green" and that they will plant a bunch of trees. A parking lot is a parking lot, and its one of the worst environments for getting a tree to grow to maturity. 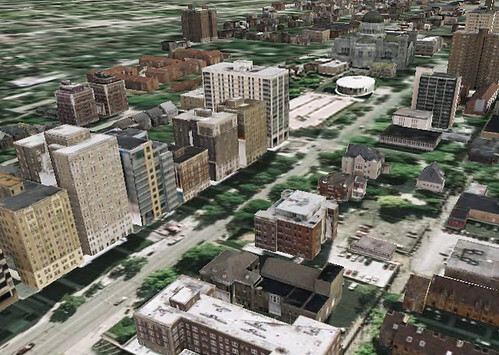 In the photos above, the parking lot image was taken from Wash U's lot at Skinker and Forest Park, which did have trees between each double row of spaces (they just did not have a great effect shading the lot). Ironically, most of the Wash-U lot is being replaced by a new building. With the Argyle Garage one block west that only reaches full capacity on Friday and Saturday nights, surface parking at Taylor is not needed. 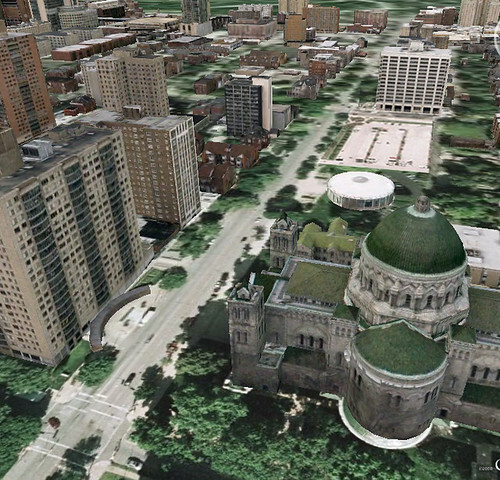 If this is deemed too far away, the archdiocese can run shuttle buses like BJC does to it's garages.